Guys Turned An Ikea Chair Into An RC CHAIRPLANE That Flies Successfully! You must be astonished when you hear the name of chair-plane. Stop your laughter, just open your eyes and see in real. Josh throws a challenge to Stefan to make an IKEA chair fly in less than six hours. Stefan burst out laughing when Josh said it. 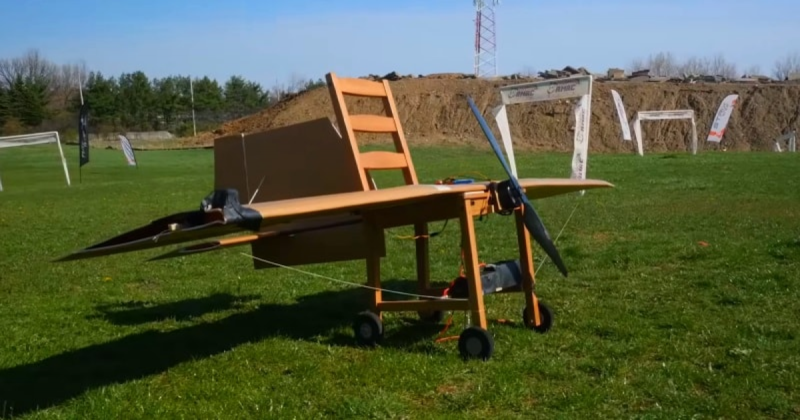 Most of the people need several days to build an RC plane from a kit, it’s remarkable that Stefan was able to whip one up in just a few hours with an old chair and some random parts. Here in this video, you can see dudes work in a shop where they build remote-controlled airplanes, so it’s not like he had to rush out to Hobby Lobby for parts. Nevertheless, it’s an objectively badass accomplishment. You can see the Chairplane’s flies in the sky successfully. If you want to skip the build details, takeoff starts at 7:13. Not only does this thing fly, but it flies well. They make the chair-plane with a lightweight wood from IKEA, just like the kind you’d use at your dining room table. They set a radio-controlled airplane that is capable of soaring through the sky. You must be inspired by this great and bizarre innovation.